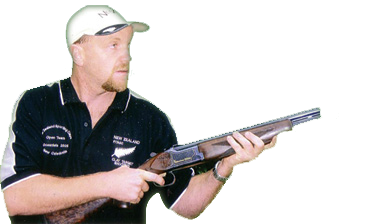 Clay Target Shooting is just 30 minutes North from Auckland, New Zealand. Come and discover the thrill of Clay Bird Shooting at Carodale Country Estate set on 40 acres in the picturesque Upper Waiwera. BEST simulated game field in the region. Valley, (this is not a gun club). As seen on TV , Carodale Sporting Clay's private range has been the feature of five separate television programmes, The magnificent clay target course is nestled in a natural setting that offers superb atmosphere and a truly unique shooting encounter. Under the instruction and supervision of New Zealand Champion and World Title Holder Dale Clark, or one of our skilled instructors, our course of up to 8 automated traps, ponds and bush setting, is designed to entice beginners and challenge the experienced. The excitement of breaking clay targets, clay pigeons or clay birds - what ever you like to call them, is truly infectious and fun the whole family can enjoy. We guarantee a memorable event for ladies and gentlemen of all ages and experience! Carodale proudly uses Fiocchi Biodegradable Wad Ammunition. Great for Shooting, Even Better for the Environment.